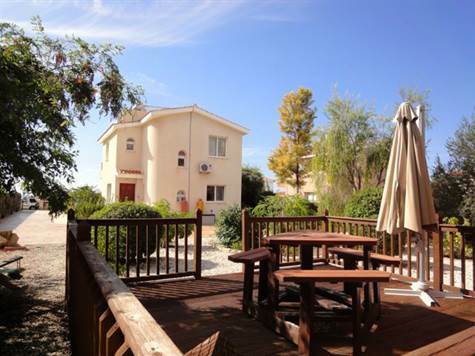 Cyprus Property Blog by Cleo : Price Reduced! Fantastic Villa in Coral Bay - Only 275,000! Coral Bay, Paphos - This beautifully presented 3 bedroom detached villa is located in a quite residential street in the prime location of Coral Bay. The shops, restaurants and beaches are a 15 to 20 minute walk, and the many amenities of Peyia, a short drive away. The property is in excellent condition and has been well maintained by the current owner. The ground floor features a guest cloakroom and open plan living room including lounge, dining area and corner kitchen. A breakfast bar with built-in cupboards nicely separates the well equipped modern kitchen from the comfortable living area. Patio windows provide easy access to a covered terrace and barbacue area, ideal for outdoor dining and entertaining. Upstairs are 3 double size bedrooms all with fitted wardrobes. The master bedroom has an en-suite shower room and there is a family bathroom accessed directly from the landing. Both the master and second bedroom have access to a balcony with lovely views of the sea and surrounding countryside. The size of the plot is stunning and a combination of fencing, trees and hedges make it very private. To the front is the swimming pool, surrounding terrace and lawned areas. The extra wide driveway at the side extends to the rear of the property and a landscaped garden provides another great entertaining/relaxation space to enjoy the fabulous outdoor life. Can we arrange a viewing for this property for tomorrow please? Thanks.